Plus 7 Tips on How to do so! Effective knowledge management has its benefits no matter the use case. It can empower employees to do more by giving them access to solutions more quickly and increase employee productivity. 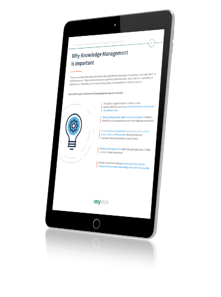 Organizations, however, can face many challenges­­ when it comes to knowledge management, including employees not wanting or knowing how to use it and not having the right tools and technologies to support it. self-service and self-help capabilities to your employees.